Star Micronics Co., Ltd. is proud to announce the new release of the additional 2-inch portable printers, the SM-S230i only for the overseas market and the SM-L200 for the world-wide market. Star is among the first to enter the Mobile POS (the payment and POS system using smartphones and tablets) market, and has a wide range of 2 to 4-inch printers including Apple MFi certified(*1) Bluetooth printers. Many Star printers are now used by many customers mainly in Japan and North America. The new Star portable printers will realize the customers' requests collected in the market where Star has gained the top market share (*2). These models are both 2-inch type but have different target customers. 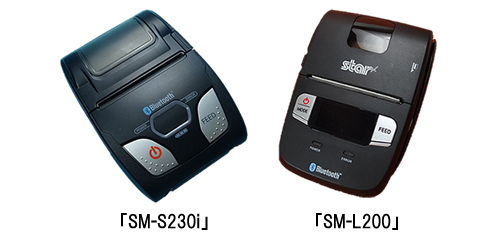 The SM-S230i is the overseas model of the SM-S210i which is sold only in Japan and has the top share in the Japanese Mobile POS market. While inheriting SM-S210i's compactness, light-weight and excellent design, the SM-S230i supports the USB communication which is more versatile than the conventional serial communication as well as the Bluetooth communication, and has the auto detect function which eliminates panel operation to switch between iOS and other OSs. The SM-L200 has some industry's first features such like Bluetooth 4.0 communication and 5V charge. Bluetooth 4.0 is a method of communication which uses the Bluetooth Low Energy (BLE) technology and allows users to communicate with iOS devices (iPhone, iPad) without MFi certification and configure Bluetooth connection (pairing) more easily. 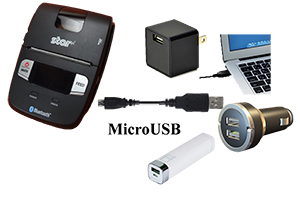 Its convenient 5V PC or smartphone charging via a Micro USB cable, which is normally used for consumer products such like smartphones, eliminates a need of the dedicated charging adapter and allows users to charge easily via a charger for a smartphone, a USB port of PC and a portable battery for a cell phone. The SM-L200 realizes the lowest price among Star portable printers and targets customers who focus on "low cost and high functionality" more than "print speed and communication speed". Star will exhibit the SM-L200 at "RETAILTECH JAPAN" that will be held at Tokyo International Exhibition Center for 4 days from March 3 to March 6, 2015. We look forward to your visit. Able to communicate using Bluetooth 4.0 (Bluetooth Low Energy) technology. StarIO facilitates developers in easily designing mobile applications without complicated communication control on diverse operating systems like Windows Mobile, Windows CE, iOS (iPhone, iPad, iPod) and Android. The StarIO SDK is available on the APP Store and Google play. *1 "Made for iPod", "Made for iPhone", "Made for iPad" mean that an electronic accessory has been designed to connect specifically to iPod, iPhone and iPad respectively, and has been certified by the developer to meet Apple performance standards. Apple is not responsible for the operation of this device or its compliance with safety and regulatory standards. iPod is a trademark of Apple Inc., registered in the U.S. and other countries. iPod touch is a trademark of Apple Inc. iPhone is a trademark of Apple Inc. iPad is a trademark of Apple Inc.